Hoop Zone is going mobile and moving its training facility! Hoop Zone, Inc. is excited to announce a change in the focus of the organization to better serve the community! We will be taking our Life Values/Hoop Skills program mobile throughout the Austin area with in person presentations. Programs will be conducted in area schools, youth centers, churches, etc. The organization will also be moving its training center and equipment to a free, donated facility at 6013 Techni Center Drive in Austin, Texas. Please continue your support of Hoop Zone and its efforts to better serve the youth of Central Texas during this exciting move and change to go mobile - directly to the community! For more information email us at hoopzone@austin.rr.com or call us at (512) 837-5553. Or, please feel free to call Bill Wendlandt (Founder) directly at (512) 680-1699. 2013 is going to be a year of exciting transition for Hoop Zone. We are working on improving our facility and our programming. However, our core message will never change. Our goal is to enrich young lives on and off the court. We started off the new year by hosting a series of youth clinics where youth in the community learned basketball fundamentals as well as important life values. 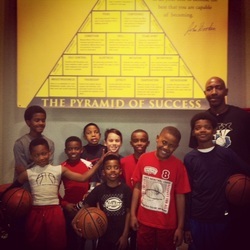 Pictured on the left is our Gym Director, Markus McKnight, with a great group of 8-10yr old student athletes. Click on Video to Play! Voted: "Austin's Best Basketball Court"
Do you want to Foster or Adopt a child who loves basketball? Basketball Gym Helps Hone Skills. It is our mission to provide the best programs and resources to facilitate the physical and mental growth of kids in Central Texas. Our goal is to enrich young men and women's lives on and off the basketball court with life values developed by the University Interscholastic League which include: Trustworthiness, Responsibility, Respect, Fairness, Caring and Citizenship. Court dediction at Hoop Zone. Kevin Durant, current NBA player for Oklahoma City Thunder, is a proud supporter of Hoop Zone. Come see the court Hoop Zone dedicated to "KD". "There is no facility like it (HoopZone) in the greater Austin area and certainly no one as knowledgeable as you to run it. You are certainly doing the community a service." "My daughter had a great time yesterday………Thanks for lighting the fire."